I love the picture on the left. 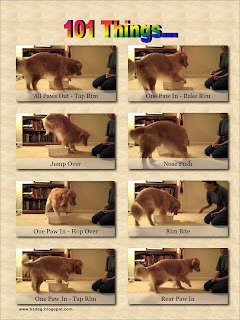 It's a "still" from a video I made for a contest on the Training Levels Group: How quickly can you click/treat 15 treats? You'll note I'm hunched over, clicker in mouth (to free up my hands), mere inches from Zachary so as to reduce delays and/or flicking errors. And while the contest was fun and I learned a lot about speed of delivery, smoothness of flicking, consumability vs. flickability, the tackiness of dog slobber, palm friction, weight and thickness and bounce height and many other properties of treats I have never considered before, and so forth... the thing I will really take away is much more basic. "...there was something very... connecting... about being so close (physically) to Zachary while working on this. There were times our heads were inches apart and I could actually see his focus and concentration. I guess I hadn't thought in the past about the distance that usually exists between us when we are working. In this case, close was nice. Close fostered teamwork." I don't normally think of training like that. I view myself as a teacher, my dogs as my students, and where I lead I kind of expect them to follow (or at least give it the old college try.) Some performance sports (for people as well as dogs) speak of teamwork, but it often looks more like "me glorious leader, you faithful follower" than Merriam-Webster's definition: "each doing a part but all subordinating personal prominence to the efficiency of the whole." I realize the picture quality isn't that great, and I'm sure I'm biased because it's my dog and I was there when it was taken, but I think the image above shows teamwork. Zachary is the epitome of concentration. 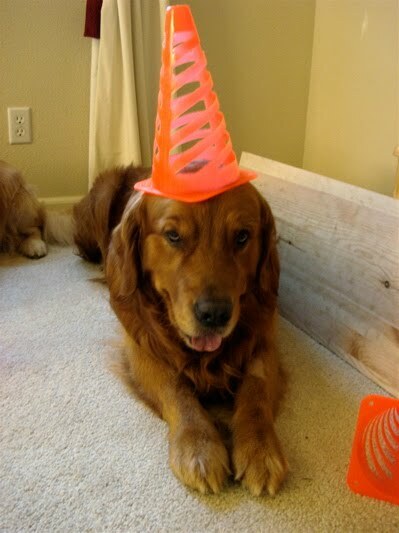 He knows his part of the job (eat treats as fast as possible) and he is waiting patiently for the signal to go. Note that at that moment he is still. Perfectly still. How often have you seen Zachary perfectly still? He is still because he knows exactly what is going to happen, and what his role will be. I am also still. I am waiting for the perfect moment, when hands and eyes and mind are all aligned and hopefully will all be working together. Now this is the game for me! 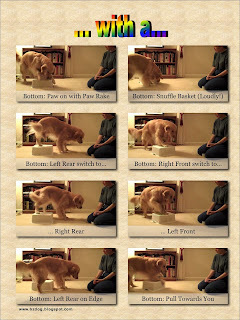 Beau and I were never a true team on this exercise as he was always too focused on the treats. In fact, Beau I were a true team only once, that I can recall, on a Rally course long ago. But for those few dozen seconds, as we wove our way amongst the cones, the world seemed to melt away and there were just the two of us, each focused intently on the other, both moving together as one. Isn't that what teamwork is all about? 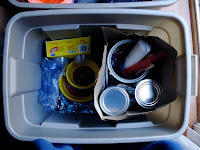 This past weekend I broke down and purchased two sturdy 18 gallon Rubbermaid containers (henceforth known as boxes) to put my Canine Homeschooling "stuff" into, having discovered said stuff has migrated pretty much all over the house. I know Human Homeschooler's of young children are instructed to assemble a variety of cheap items that can be used for a variety of things (think: crayons, pasta shapes, aluminum foil, paper plates, and plastic cups...) that can be turned into things for counting, measuring, building, stringing, decorating, etc. ... but what to put in the boxes? The boxes are stacked on atop the other, and on top of them are a stack of empty soda boxes (moved from the top of the fridge) for "Find It!". Shoved between the boxes and the wall is small pine board (1"x8"x18") for Contacts. In truth, the mats could be stacked on the boxes as well, leaving me one nearly empty box and one about half full. 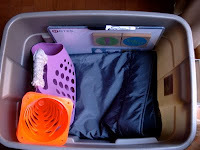 Well, the dog toys have their own basket, the dog books go in the bookcase, the dog bones (food, treats) go in the kitchen cupboard, the dog adornments (collars, scarves, coats, boots) and other dog necessities and frivolities (meds, records, pictures, etc.) also have their own locations. But shouldn't there be more? But I'm just not sure what those things should be. 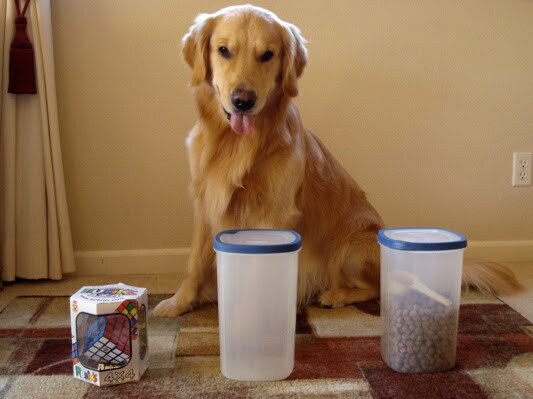 So, if anyone has any thoughts for what should go in a "Canine Homeschooling Box", things that I can mix and match and have some fun with, things that can be used for "Enrichment Activities", things that every Canine Homschooler shouldn't be without, feel free to share! Step 1: Take a stack of paper (I used 24 sheets of cheap notebook paper) and wad each sheet up into a loose ball. Step 5: Show the dog a cookie, then wad it up in the middle of Yet Anther Piece of Paper. Step 7: Stand back, and give your release/Find It! command. Want to make it harder? Instead of tossing the balls into a bag, put your dog into a down and toss the wads on the ground in front of him. To make it easier, set the whole thing up with your dog blocked out of the room. Beau didn't have any problems with this at all. He is a careful, methodical searcher and found the right wad the first time, every time. 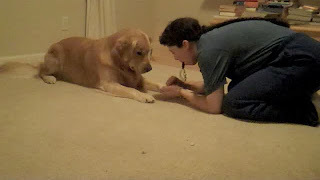 His way of indicating is to take the wad and nose it out of the pile, at which point I open it up and give him the cookie, toss that one paper wad (tainted with cookie smell), put him back in a down, get a clean sheet of paper, and start up at Step 5. It took Zachary a few tries to figure out what game we were playing. 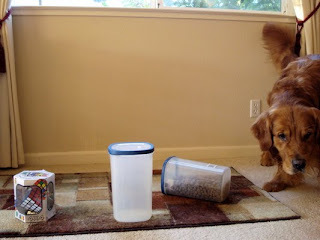 I think he was just having a lot of fun shuffling the wads around, until he finally figured out there was food in one of them. After that, he settled down to searching, but his technique is poor (random and rushed) so it takes him longer. His method of indicating is to put a paw on it and attempt to disembowel the helpless paper wad. (Editors Note #2: The incredibly observant might notice a slight change in the description of this blog. Enrichment is “… a process for improving or enhancing animal environments and care within the context of their inhabitants’ behavioral biology and natural history. It is a dynamic process in which changes to structures and husbandry practices are made with the goal of increasing behavioral choices available to animals and drawing out their species-appropriate behaviors and abilities, thus enhancing animal welfare (AZA/BAG 1999)." Ok - enough background, what about my captive animals (the four-footed ones)? Sensory: I think they really love the texture/hardness/give of the Lacrosse balls, the softness of the woolie toys, plus they get to play "Find it!" every day. 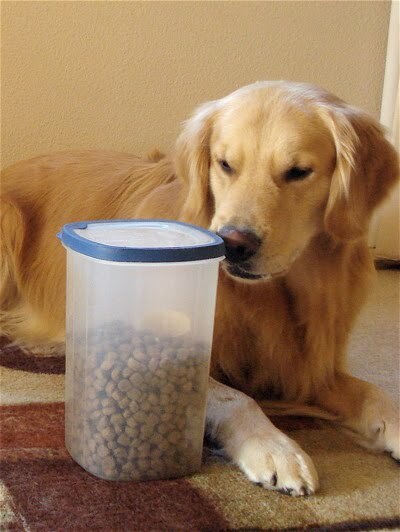 Feeding: They certainly get a large variety of foods, from kibble to cookies to carrots. Peanut butter is a crowd pleaser, as are hot dogs, deli-chicken, and cottage choose. But the mode of feeding isn't at all imaginative (bowl/fingers) and has nothing to do with "the wild". Manipulative Toys: They have plush toys that they love to carry around, toys they like to find, toys they get to eat (chewies), toys to chew (Lacrosse balls make AWESOME chew toys), and toys for playing tug. They get to rip apart boxes/bags (frequently!) and sometimes I put things into the boxes/bags to make it even more fun. Environmental: Their environment is my environment, but as they don't use a computer, watch TV, or have their own set of earbuds, their environment is probably lacking. There is a yard, which they are free to go into, but other than to get rid of the zoomies they rarely go there. They do get walked a couple miles each day, but that's about it. Social: So long as human's count, we're good. These are house dogs, who live and sleep with us. Plus they have each other for company, and they really do seem to enjoy being and playing together. They also get out to the pet store and sometimes to meetings or classes. Training: Yes! They love training (class) time, and they get at least 5 "formal" sessions a week. They also get countless mini-sessions as an excuse to toss them a cookie. If I was to give myself a grade? 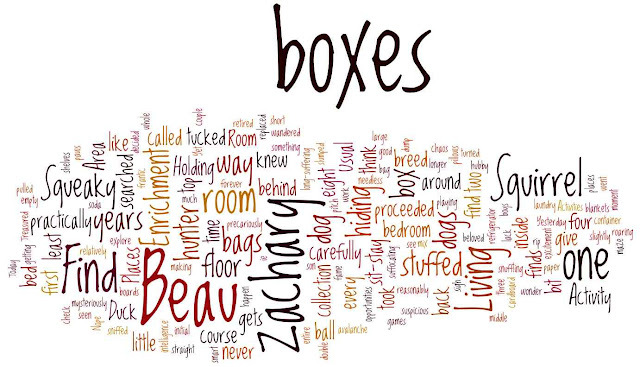 Beau hunts first (of course) in the Living Room, while Zachary gets the back bedroom. I'd like to do it the other way around, since Beau is a much better hunter and the bedroom affords more hiding opportunities, but Beau gets... animated... while watching Zachary hunting. As the Living room is visible from the Holding Area, and Zachary is a less then stellar hunter (ie: takes forever) and we happen to like our neighbors, we keep things the way they are. 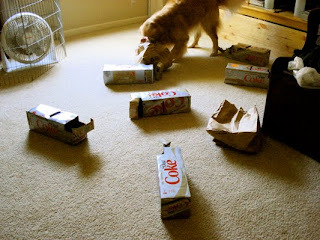 Yesterday, in my quest to enrich their Enrichment Activities, I pulled down our relatively large collection (eight) of empty soda boxes which we carefully store (or precariously perch, depending on whether they avalanche on you) atop the refrigerator. They are there so that we can toss one to the dogs every so often to give them something to rip up (Yet Another Enrichment Activity.) 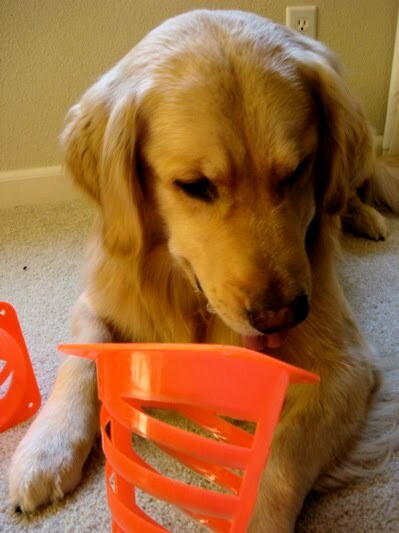 It's also fun to show them a ball, drop it inside a box, crimp down the top, and then give them box. To see their frantic shredding of the hapless box, you would think the ball was suffocating in there. Today, while Beau was hiding in a sit-stay, well out of sight, I took the entire collection of boxes (all eight) and spread them out on the Living room floor. 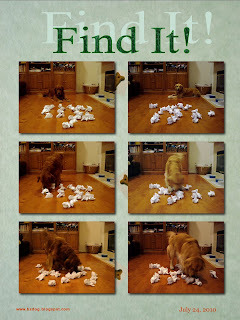 I added a couple brown paper bags to the mix, stuffed Squeaky Squirrel in one of the boxes, and called "Find it!" But in all those years - for thousands of "Find It! "s - there has never been a pile of boxes mysteriously deposited in the middle of the Living Room floor. Don't you think he would be at least a little bit suspicious???? He came roaring into the room, practically fell over the boxes, sniffed the first one as he ran by and then proceeded to check out the Usual Places - carefully picking his way through the maze of boxes to do so. Finally, the Usual Places searched and double searched (Beau is a very thorough hunter) he decided to explore the boxes. 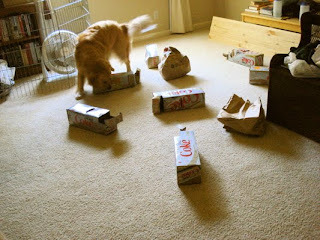 He did redeem himself slightly by finding it in short order, but still - I have to say I was more than a little surprised by his lack of initial curiosity about the cardboard chaos I had created. After that find the boxes were retired, Beau had his two more "normal" finds, and the dogs switched places. 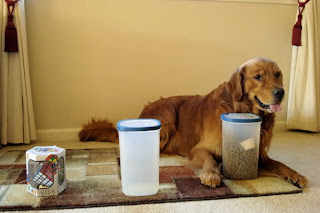 With Zachary in a sit-stay (who am I kidding, I'm sure he slumped as soon as turned the corner) I proceeded to dump the boxes and bags back onto the floor, stuffed the Squirrel into a bag this time, and called "Find It!" 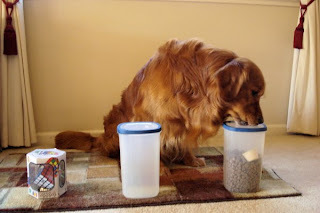 Zachary, a credit to his breed, went straight to work snuffling the boxes and bags, and while he took a bit longer to find the right container, at least he knew to look in the containers! Anyway, needless to say a good time was had by all and this Enrichment Activity received two very big paws up. ... and so I did. I posted my question on July 15 (Thursday) to the Training Levels Yahoo! group and boy they come through with some really great ideas. Movement: I have been sprinkling spins, weaves through legs, walking backward,... etc. during training time and I've been seeing good results. Both dogs love that sort of thing and just a few seconds of it (with clicks and treats, of course!) is a noticeable pick-me-up for both of them. Start with something easy and end with something easy: Sounded good to me, and was really easy to do! 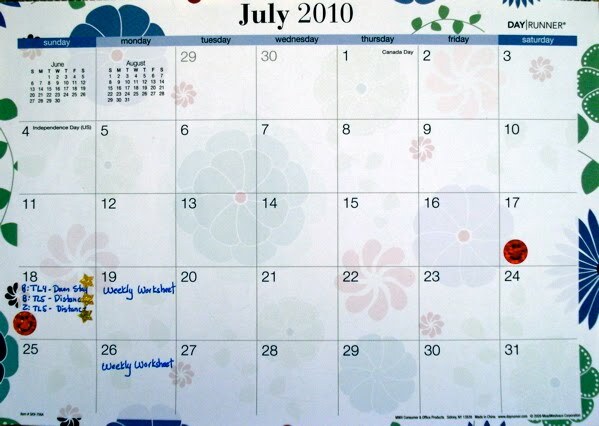 Create a Gold Star calendar for days trained: Another low-hanging fruit idea that worked out exceptionally well since the local office supply store had several varieties of cheap calendars that actually run July-Jun (who'd a thunk it - must be for school?) Even better, the pages are tear-off, so I stuck the current month in my clear clip-folder of Weekly Worksheets. I made it last, turning it so it "looks" out the clear back cover. I bought some little sparkly gold stars to mark items completed, and sparkly rainbow-colored happy faces for days trained. Awwww... I will admit my track record for keeping calendars up-to-date is extremely poor, except for the one I keep at work, so we'll see how long this actually lasts. I'm thinking of adding a Calendar page to this blog, but I'm having trouble imagining anyone cares but me, and I have the original so I don't need it on line. ... and I guess that just about does it. For now! 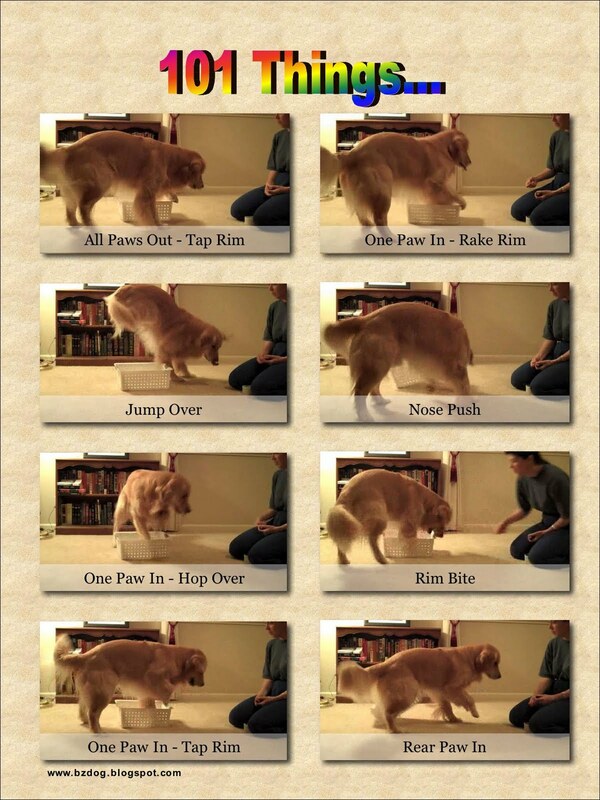 ... And the same list of 100 ways to make class fun for the dogs, grouped into broad categories. 94. Finish behaviors so they can show them off - they love the attention! 96. Have a "recital" once a week for family - they love the attention! 95. Show off things trained to family - they love the attention! 82. Figure out what their instincts really are! Problem: In what ways might I improve class (training) so both the dogs and I will enjoy what we are working on and I will remain enthusiastic about reaching my goals. Keep track of what works and what doesn't (to avoid the first and do more of the later. ... figure out what their instincts really are! Finish behaviors so they can show them off - they love the attention! Show off things trained to family - they love the attention! Have a "recital" once a week for family - they love the attention! Lack of progress toward goals. Class time is no longer fun (for me) but work. I want to work on fun stuff, but know I should be working on "real" things (like duration activities, Training Levels things, etc.) and even the fun stuff I have on my list just doesn't seem that much fun lately. [I want to] see the boys enjoying themselves learning new things. [I want to] realistically enter Zachary in a Rally trial this fall. [ The problem began when ]I fell out of the training habit/rut and haven't found the rhythm again. I want to return to the happy way I used to feel after class time, when I could cross things off the list or watch the videos I made, and know that progress was made. Assume a myriad of solutions: "In what ways might I..."
... and they even suggested a formula for the stuck: “In what ways (action) (object) (qualifier) (end result)?” as in "In what ways might I package (action) my book (object) more attractively (qualifier) so people will buy more of it (end result)?" In what ways might I improve class (training) so both the dogs and I will enjoy what we are working on and I will remain enthusiastic about reaching my goals. Remember, the Happy Manager says: "The secret to defining the problem, is really about attitude. Try to see every problem as an opportunity." They also provide a Question Checklist to Investigate Problems - and that is what we are going to do today. What (exactly) do I want to achieve? I want to be making verifiable progress toward my goals. I have been having difficulty motivating myself to work on the things on my list. The boys seem to be having difficulty with the latest things, but I'm pretty sure it's how I'm teaching them and not any problem on their end. I want to work on fun stuff, but know I should be working on "real" things (like duration activities, Training Levels things, etc.) and even the fun stuff I have my list just doesn't seem that much fun lately. What would happen if no decision was made or solution found? I will loose momentum, fall out of the training rut, and nothing will happen at all. What do I need in order to find a solution? I need to understand why the wheels feel off! Why do I want to achieve a solution? So class time can be fun again. So I can see the boys enjoying themselves learning new things. So I can realistically enter Zachary in a Rally trial this fall. Why did the problem or opportunity arise? Perhaps because we moved on to hard things? Or things that take longer? Or possibly because I fell out of the training habit/rut and haven't found the rhythm again. Why do I need to find a solution or way forward at all? Because if I don't I'm afraid I'll quit working toward my goals. Because there aren't any classes around here that I can enter Zachary in, and I want him to keep learning. Because they are both smart dogs and I hate to see them bored. How will the situation be different? (I'm guessing this means compare the current situation with the "solved" situation) I want to return to the happy way I used to feel after class time, when I could cross things off the list or watch the videos I made, and know that progress was made. How can I involve relevant people? The dog groups are both good sources of input, if I can pinpoint a particular (relevant) problem. Where did the issue arise? Both at home and On The Road, I guess. Not for the problem, although possibly for the solution. Perhaps a change of venue will put a spark back into things? Me, me, and... uh... well... me! Who cares about this situation? Who is affected? No one cares at all but me. No one is affected but me. Who is involved (information, help, action)? The dog groups might be a source of information and/or help. This spring, during the time Zachary was taking the CGC class, when my son was playing Lacrosse, and during Finals. I believe we also started Training Levels Four around that time. When do we need to act? By when must be resolved? ... you know, after all that, I actually think I have a germ of an idea - but this post is already too long and the boys await, so it will have to wait until tomorrow. Merriam-Webster defines ambition as "an ardent desire for rank, fame, or power" and a "desire to achieve a particular end." While the first definition might apply to a subset of Canine Educators, those striving for titles or placements, I'm definitely not one of them and the sort of ambition I'm talking about here falls under the second definition: a desire to achieve a particular end. Now, I generally believe that ambition is a good thing. Ambition keeps us heading toward our goals, even when our lives are too busy, the conditions adverse, and the work is hard. But there is a negative side to ambition - and not just the sort that was portrayed so well in the 80's movie Wall Street. I believe that ambition turns from good to bad when we become so focused on the act of accomplishing something that we loose sight of why we are trying to accomplish it. If recognizing there is a problem is the first step towards solving it, then consider step one accomplished: "Houston, we have a problem." Let's go with: Lack of progress toward goals. I think it is important to emphasis "progress" here, as that's what seems to be lacking. I do not believe this is an attainability, capability, or trainability problem. While my goals might be overly ambitious for me, given how much time I have available, the worst that should happen is that I fail to accomplish some of them, not this dead-in-the-water syndrome I seem to be stuck in. ... and here Happy Manager notes: "The secret to defining the problem, is really about attitude. Try to see every problem as an opportunity." Back to the Happy Manager I go, and find yet another page with yet more questions to answer. Alas, as this post is already getting a bit long, I have much to ponder, and the dogs' vacant expressions suggests time spent on the computer isn't helping their education (or my progress) one bit. Yes, we are still talking about Contacts. We are still working on Contacts. We are still thinking, dreaming, and obsessing about Contacts. Tonight was by the far the best practice session yet, both per dog and in total. 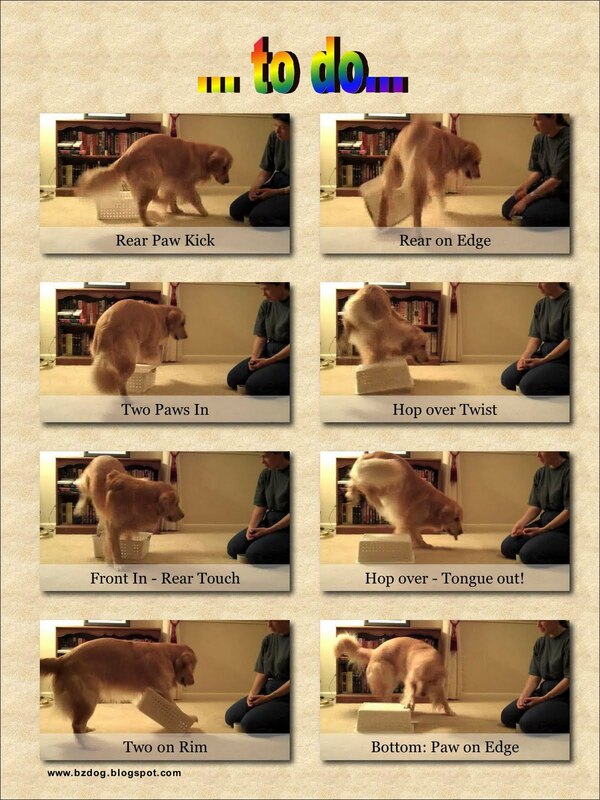 Beau is pretty nearly there, especially since this is an optional behavior and I’ll never do Agility with him. Zachary is still playing “101 Things to do with a Contact Board”, although after the first dozen or so passes he settles down to something approximating the desired result. 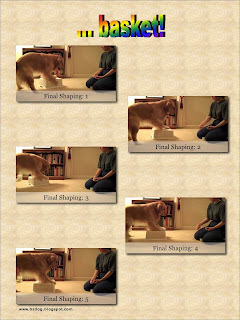 I upped the criteria again and now expect all four paws on the board plus stillness and, not surprisingly, that final paw wasn’t nearly the challenge that lack of motion continues to be. I brought the mat back out and once again put it at the end of the hall. Beau was a bit hesitant, as it is now a good fifteen feet or more from the Contact Board, but Zachary zoooooomed down the hall and threw himself on the rug, looking more like a Golden Border Collie than a Golden Retriever. Sometimes I just held them for a few seconds, but on at least one occasion both dogs were held there at least 20 seconds and neither looked like they would break. I thought the change from running the board to lying still would be harder for them, particularly Zachary, but that doesn’t appear to be the case. Once again, that which I think should be hard turns out to be easy, and that which should be easy is nigh impossible. All in all, though, a good nights work from both boys and a nice start to the end of the week. Anyway, until I find something that speaks to me equally well, don’t be surprised if the background and look don’t morph a few (dozen) more times. 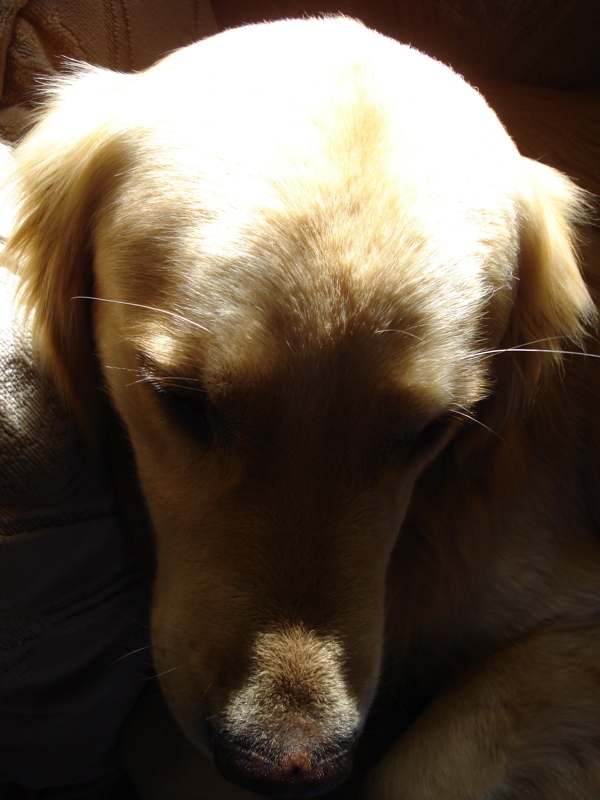 I hate practicing the "boring stuff" - usually defined as duration activities requiring me to stand around patiently waiting for the clock to tick off a certain number of seconds/minutes while one of the dogs remains in roughly the position I left them in. Yes, I know the "boring stuff" can be important. Yes, I know patience is a useful skill. Yes, I realize life can't always be exciting. But I'm old enough to feel I shouldn't have to do something I don't want to in an activity I'm doing just because I want to do it. So tonight I tried something different. Tonight I pulled out my Go To Mat mat and put it at the far end of the hall. Then I pulled out the Contacts board and laid it out in the Living Room. For the remainder of "class time", after every half-dozen runs across the board, I sent the dog to the mat for a few seconds. A click/treat, and back to the board they were sent. What I'm hoping is that I can get to the point where one dog can lay on the mat while the other works for a few minutes, and then switch them. I figure this way they get their duration practice in and I don't have to stand there and stare at them. Will it work? I have no idea, but it's looking good so far. As for Contacts, I have gone back to pure shaping. 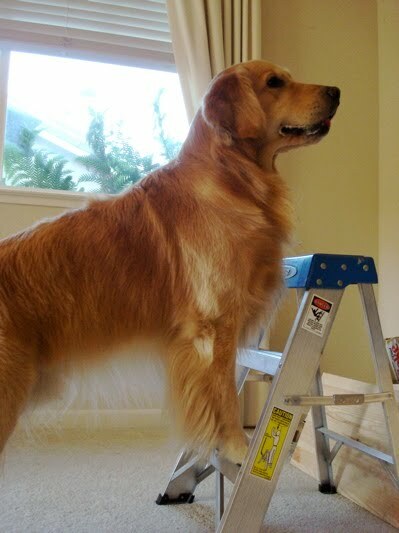 The light bulb is starting to flicker on in Beau's head, and he is getting very good about stopping at the end (usually four paws on, but sometimes two on/two off.) Zachary is still in "101 Things to do with a Contact Board" mode, but he is getting better. I'm at the point where I was with Fronts, where I'm mostly looking for still (always a problem with Zachary) plus three paws on the board. Three paws on makes him pointed roughly down the board, which is good. 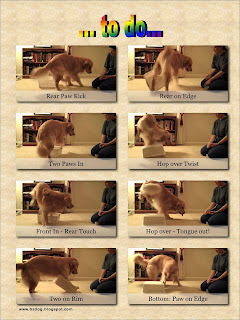 One Rear Toe On had him side-stepping across the board - cute, but not what I was looking for. I have this nagging feeling that I made Contacts much too hard by being in a hurry, and had I just stuck with shaping both dogs would be done by now. ... at least not at my house. 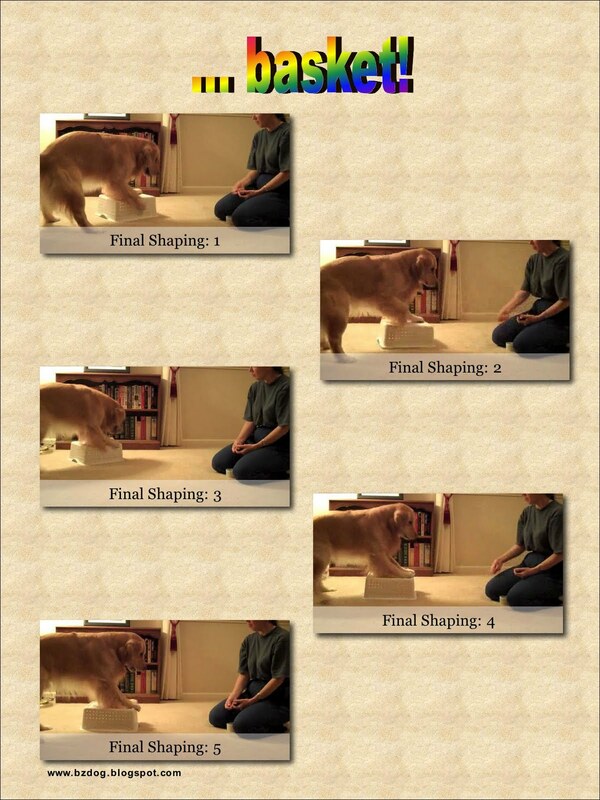 In fact, had I decided to video all my efforts to capture the elusive Level Four (two minute) Sit-Stay on video, I would have quite the Keystone Cops collection by now. Now it's not like the boys, if sufficiently (self) motivated, are not capable of the physical act of sitting for two minutes at a time. I'm pretty sure I've seen them sit for five, maybe even ten minutes without twitching a whisker if they thought there was a chance something from the dinner table might find it's way to the floor. Nope, what we're talking about here is me telling them to sit, me walking away 40 feet, turning around, and waiting for two minutes to elapse. Today I thought I would try something different. Thinking a change in venue might do the trick, I took Zachary out back, set up the camera, and walked 40 feet way. Zachary did some lovely heads up heeling as we marched down the brick walkway - too bad we weren't working on that. I let Beau tag along, figuring I could use him as my distraction. Otherwise ignoring the big dog, I pointed to my designated spot, told Zachary to sit-stay, and confidently walked 40' back down the brick walkway to the camera. I have to say I was a bit surprised when I turned around to see Beau sitting there as well. 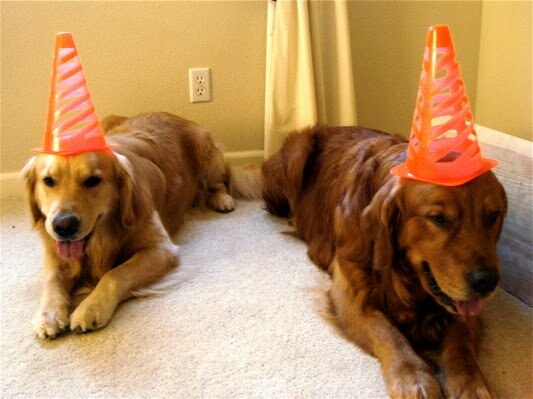 Ok... synchronized sitting. There went one of my distractions, but I still had a tug toy and a ball at my disposal so I wasn't worried. And I shouldn't have been, as 30 seconds later Zachary slumps into a down. With the Big Dog still sitting tall, I decided to wait it out to see what would happen. After a minute I tossed the ball. At 1:30 seconds I tossed the tug toy. ... then Beau slumped into a down as well. Off went the camera, and I marched back down the brick walkway. Four big eyeballs stared up at me and nobody moved a muscle. I think somewhere in the back of Zachary's little mind something must of clicked, because as I stood there and glared at them (and no cookies appeared) Zachary sheepishly returned to a sit. Beau, with more experience, held fast to his down. He no doubt realizes by now that if he wasn't supposed to have laid down, switching to a sit at this point wasn't going to help matters any. Enter the Keystone Cops, for as I made my "Thou Shalt Sit (and I really mean it this time!)" hand signal, Zachary took off down the walkway in search of the ball I had thrown earlier. Then Beau took off down the walkway after Zachary, prompting a case of synchronized zoomies. I called Zachary (knowing it would have been pointless to call Beau) and attempted to reset things. I'll spare you the details - suffice it to say it wasn't pretty. I gave it four more tries (yes, I'm a glutton for punishment) and never made it past the 1:30 mark again. Searching hard for a bright spot (between Zoomies, selective deafness, and dogs dropping and popping back up like Wack-a-Moles) I'd have to say that they did hold firm against all the distractions I tossed (literally) their way. Now all I need is for them to grow a backbone. Zachary doesn't like thuds, thumps or banging noises coming from outside. Period. He responds to such noises with a series of Gatling gun barks, with a growl thrown in every now and then for good measure. Beau couldn't care less if there were thuds, thumps, or banging noises outside, but will dutifully back up his housemate with his heavy Howitzer bark. Since fireworks falls under the category of "bangs", and I didn't care to have my house sounding like a war zone Sunday night, I figured a preemptive strike was in order. So shortly before the rockets were due to launch, I tuned to the PBS channel on TV (fortuitously replaying the National fireworks display backed by patriotic marching band songs and the 1812 Overture - an advantage to living on the west coast) and cranked it up really loud. 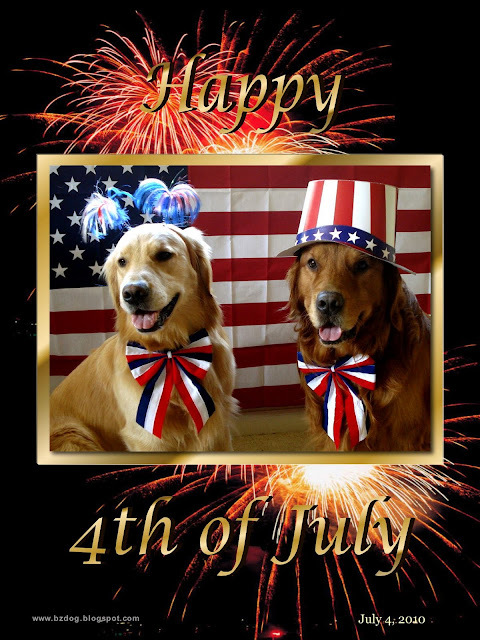 Then I pulled out the cookies, and proceeded to march around the house with a pair of oblivious Golden Retrievers marching along right beside me. We had a grand time. I have never done much heeling with both of them at the same time, but that night I gave it a try. It was a riot. We were marching forwards, backwards(! ), and I was flinging cookies left and right. Then I switched to some glove retrieves. Two dogs, two gloves at 20' - on your mark... get set... Bring! Zachary was the clear winner, paws down, and when things slowed down because Uncle Beau isn't the fastest retriever in the west, Zachary "helped" by grabbing the glove from Uncle Beau and quick-timing it back to me. I'm not sure if either of them learned a darned thing, but there were lots of laughs (from me) lots of cookies (for them) and nary a bark to be heard. ... well, except for "Stars and Strips Forever" blaring away in the background. Anyway, suffice it to say that "101 Things..." is a game right up his alley. If you want see him in all his video glory, CLICK HERE. Afterwards, I went through that video frame by frame and was appalled a the number of "Clickable Moments" I missed - a half-dozen or more. Times when he clearly did something different and I missed the difference entirely. Sometimes it was subtle, but often it was a paw switch on his part - doing something with a right front and then trying it later with a left front and me not noticing the change. Anyway, I grabbed images from the video and put them in a few annotated pages. Time runs top to bottom, left to right, as though you are holding up two film strips side by side. The last page is the final shaping session at the end. Given his "artistic" nature, I didn't want to end the session without reminding him how we normally shape to accomplish something.